Today we present a recipe that will surprise your guests with this little appetizer, we used our organic orange marmalade. Put to soften in a skillet over low heat, with two tablespoons of olive oil cut in julienne scallions. Stir occasionally until we see the onion with a light golden color. At that time we add to the pan two tablespoons of organic orange marmalade. Mix until both ingredients are well integrated and let them make a couple of minutes over low heat. We turn off and remove the pan from the heat. As we prepare the lining grinding a baked potato in a bowl. Add the grated hard cheese, cream and a little oil. Salt and pepper and mix until a smooth paste and smooth. Reserve. We stretch a sheet of phyllo dough and place on a corner a slice of goat cheese in small curler. With a teaspoon we catch a bit chive and organic orange marmalade and place it on top of cheese. We roll up the cheese with phyllo on a regular basis. Fill the rest of the sheets following the steps above. Fry in a skillet over medium heat with extra virgin olive oil. When we have the crispy goat cheese with organic orange marmalade brown on all sides, we draw on absorbent paper. 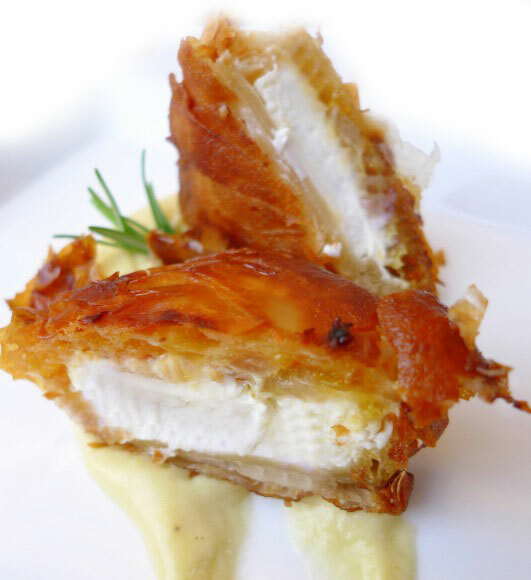 We serve over mashed potatoes and cheese, making crispy cheese garrison. 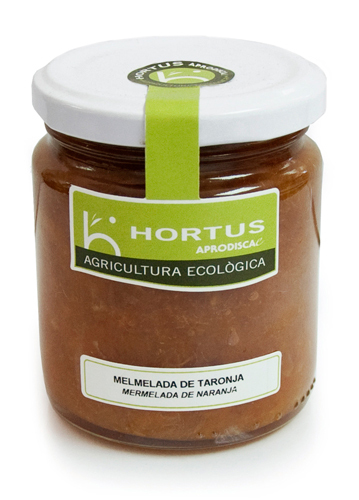 Where can you find our organic orange marmalade? 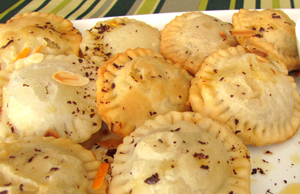 For us the concept of ravioli is always linked to a starter or main course, but in Italy even get to use as desserts. In this case we suggest you do so as dessert stuffed with our organic orange marmalade. Make stuffing with pine nuts, a half tablespoon of honey and organic orange marmalade until uniform. Using a brown plate as a template cut the dough into circles that will deposit on a plate with flour. If one is engaged and is a hole, we can cover with the remaining pasta. How only remaining cuts can recycle the pulp to make new ravioli. To make the ‘sealing’ end will each circle over a floured wood filler deposited portion and closed so that the final shape is a semicircle. 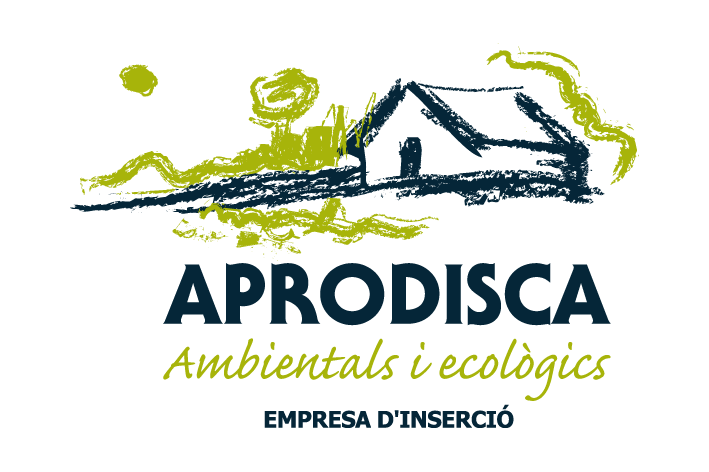 We can also do it using two circles with the filling between the two and in this case the shape will be circular. To close them, get wet finger to the outer rim of the circle why locks. With the help of a fork will seal the two sheets. We put the ravioli in a glass container we oiled previously and finish “paint” using a brush made with paper towels, the top of the ravioli with a beaten egg (as if we were to make an omelet). Finally we will put the furnace and heated to 180 º have I turned up and down. How is golden brown (about 20 min) let cool and we can serve. To decorate you can put the chocolate black erasure over ravioli. 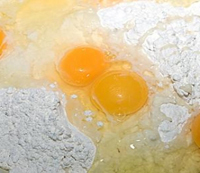 We will put the flour in a large bowl and make a small crater in the central part where we’ll take the eggs. First one and stir and detached another and continue stirring. While we are mixing the flour is adding to the dough and rest the bottom of the bowl and is not engaged, which will ultimately spare. After about three minutes, the mixture deposited above the marble kitchen that have been coated with flour. It’s time enharinarnos hands and start kneading. You have to get good too, silky and elastic. When we consider that is about (the operation takes about 15 minutes at a time just barely engages the fingers) put salt wrap it with a damp cloth and leave in a cool place to replace about 30 minutes (or refrigerator if necessary) before continuing. Once the pasta is replaced, we put it on the floured marble flour and roll had previously also floured surface until a significant (there you go dusting with flour if we see that hooks) and you proceed to cut. The alternative way to do it is to have one of these machines with rollers, specific to iron, which in fact is the most comfortable way. To cut it all depends on how we want. For we have too rectangular and circular problem, we can do it with a plate of coffee as mold cutting circles with the tip of a knife and depositing the parties on a plate with flour. If you are engaged or is a hole, we can cover it with leftover pasta. How only remaining cuts can recycle kneading the dough again. But we roll, we can replace it with a bottle we’ll have filled halfway with warm water. Today we present a very easy dessert that will have prepared him for a moment, you shall be like a gentlemen. We take the pineapple, peel and cut into small dice. 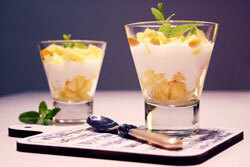 To serve, we take the cups pineapple intersperse with Greek yogurt sweetened with orange marmalade, and repeat once more. To end the show we can put some mint leaves. You like candy? 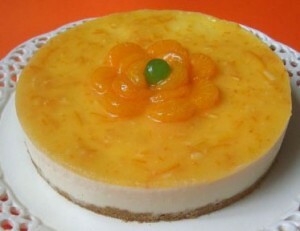 Then we present a very simple cheesecake make with organic orange marmalade. Crush cookies progressive 5-10 . Add the margarine at room temperature and spray again to see much involved. Place the ring mold on the tray where we will serve and smash into biscuit mix , lining the base. Reserve in the freezer while preparing the cake. In a deep dish with water, let the gelatin sheets items to soak for 5 minutes , because they hydrate. Squeeze orange juice and heat about a minute in the microwave , do not boil . Toss the drained gelatine leaves and stir until completely dissolved. In a bowl put the cheese , milk , fructose , and jam , mix all the blender and then pour the orange juice with gelatin, and stir . We took the base we had reserved in the freezer and toss the mixture inside. Leaving replaced in the freezer or refrigerator for several hours or better overnight . Once curd, we can decorate to our taste, along with some mandarin orange slices in syrup or marmalade use the other we have left in the pot , mixed with a sheet of gelatin , dissolved in two tablespoons of hot water. And replacing it in the fridge until it hardens coverage. The warm touch of this salad makes delicious and complete aswell. Cut the lettuce and cabbage and reserve. Saute the mushrooms and asparagus tips in the pan. Gilded bacon bits equally. The proportion of the vinagrette three parts oil to one of vinegar. Stir everything and assemble our salad placing the hot components above with our vinaigrette.